“If Fish Could Fly” Receives an Injection of Energy! 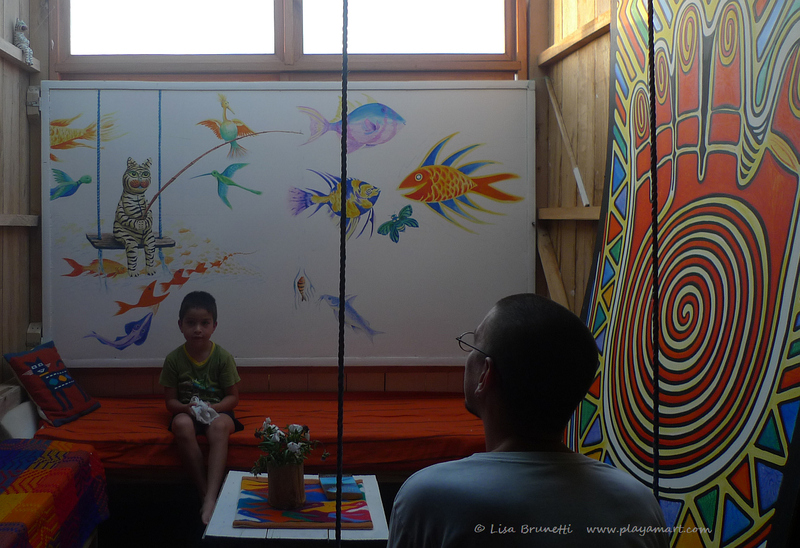 Gonzalo and Nicolas absorb the visual whimsy of the riverhouse! The riverhouse received an injection of energy this weekend! 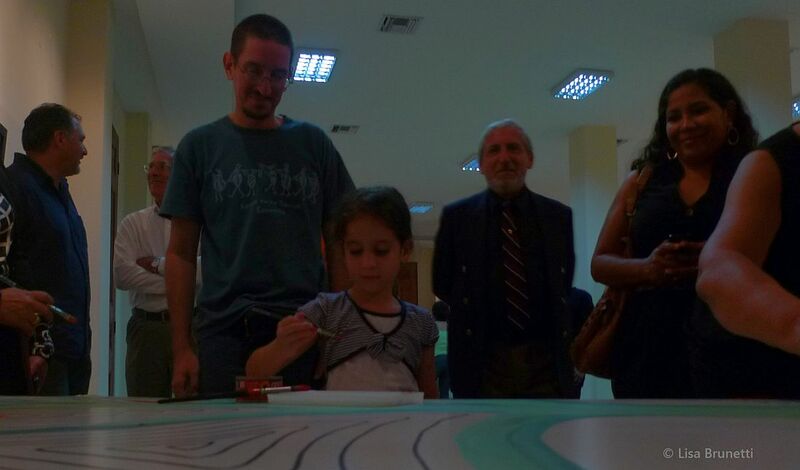 Gonzalo de la Fuente and his beautiful family crammed many memories into their short break from the port city of Manta Ecuador. Gonzalo is quite the Renaissance Man, and his graphic arts skills keep his dance card full. I am grateful for his tireles help whenever I need posters, invitations, a press release, catalog, book marks, business cards – he transforms and improves the concepts. 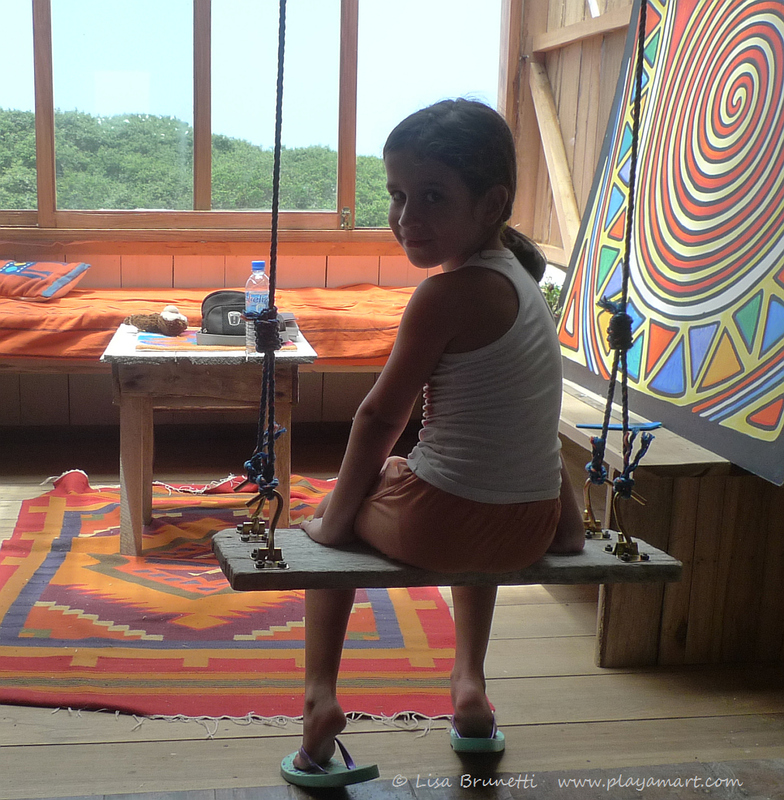 Although I often visit Gonzalo and his family on their turf, this was their first trip to the Jama area. These photos reflect one of many great memories from their two-day visit. Opening the panel and revealing the window offers a dramatic view of the river!. Natalia and Nicolas enjoy the window seat. “Oh, no, Natalia; this is an art exhibition. We are going to look at the paintings,” they replied. 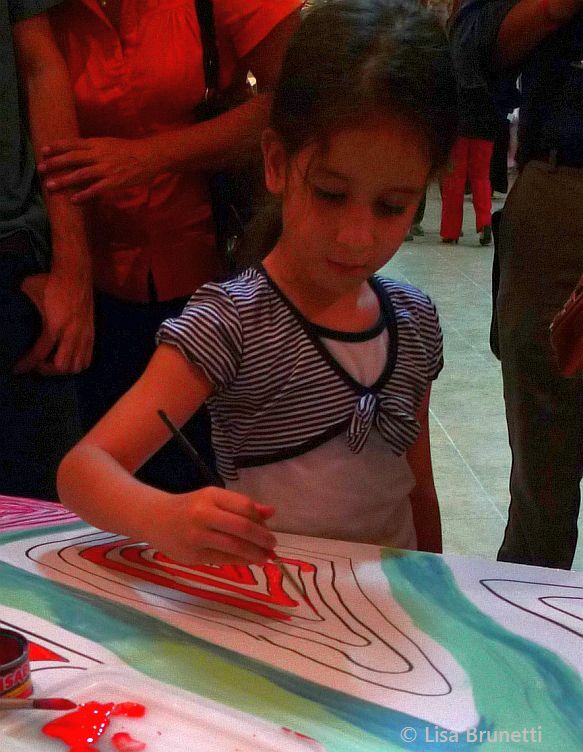 They entered the show and discovered that Natalia could indeed paint, along with anyone else who wanted to help fill the space with design and color! Natlalie indeed gets to paint! 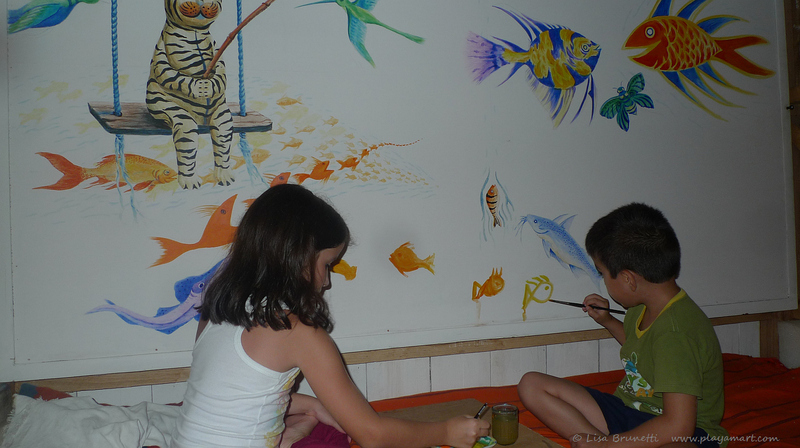 Eyeing the “If Fish Could Fly” painting, Natalia and her brother Nicolas contributed an amazing assortment of new species of flying fish as we watched in stunned amusement! Without the aid of pencil, they dabbed their brushes into the paint and flew! They returned today and critiqued the painting. They did a great job; don’t you agree? You can visit Gonzalo on WordPress HERE! Can’t wait to see it. A real painting to paint on; better than a chalk board. Of course I do, :). Z – Surrounded by water AND art. What more you could you ask for! Nicely done. thanks! tonight that water is quite bravo after all of the rain we’ve received over the past few days. the house continues to ‘collect’ more art – most of it in different stages of progress! it’s a bit wild right now! 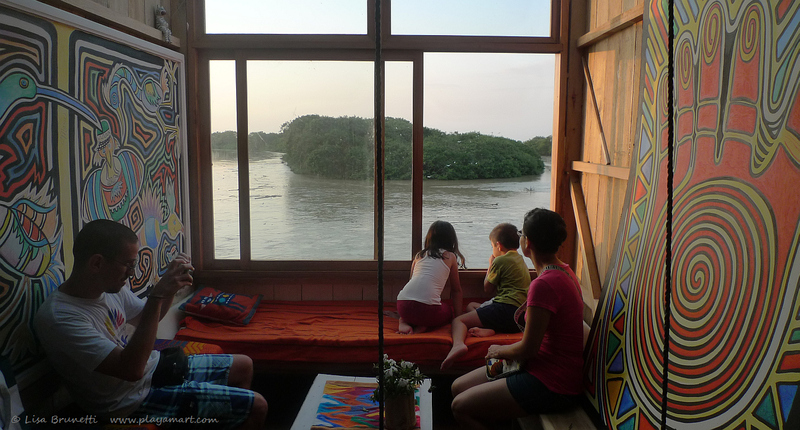 As the Palladian Traveler says above – surrounded by water and art indeed, but I bet the family benefited most by being embraced with the love of life that emanates from you in your beloved home! We are blessed to call you friend – Have a great day. i have figured out how to get faster internet: stay up til three in the morning, and then no one else is slowing down the connection! wow has it ever been fast(er) and i am able to reply without having to wait minutes before the reply goes through! What a wonderful addition to the picture, and a great encouragement for them. I like their enthusiasm, undimmed by self-doubt and self-criticism! And you have a swing in your house!!! yes, they were amazing little apprentices, and yes, the swing adds such whimsy and makes a great seat for viewing the river! Love the river house. It offers and oozes creativity. How lucky these kids were to get to be a part of your create and share attitude. Lovely family. Wow! a swing! Absolutely lovely Z! I love the whimsey with the cat fishing! The kids added some nice touches! And, I love the swing in the house! What a great seat! it must be wonderful to paint while sitting in your riverhouse looking out of the large windows watching how the river flows! I’m amused by the little painted Zebra cat! congratulations, that you have these friends! Beautiful and so much fun! Thanks for all of the joy you share with us. What a beautiful view of the river! 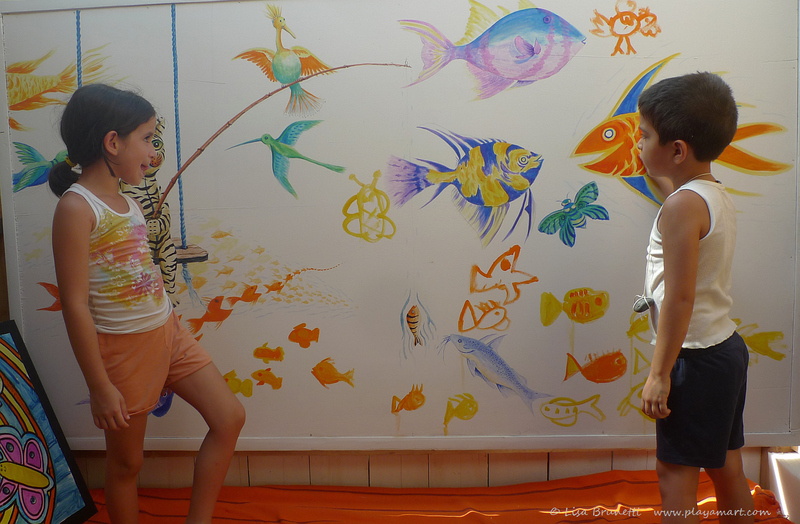 It’s such a joy to watch kids paint the “If Fish Could Fly”, love these photos. Thank you so much for sharing! 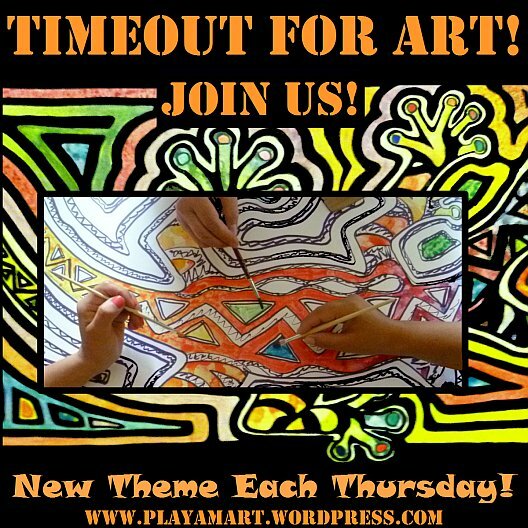 Your blog is a visual feast! thank you for sharing your wonderful little friends. Hey Lisa! Thanks for your post! 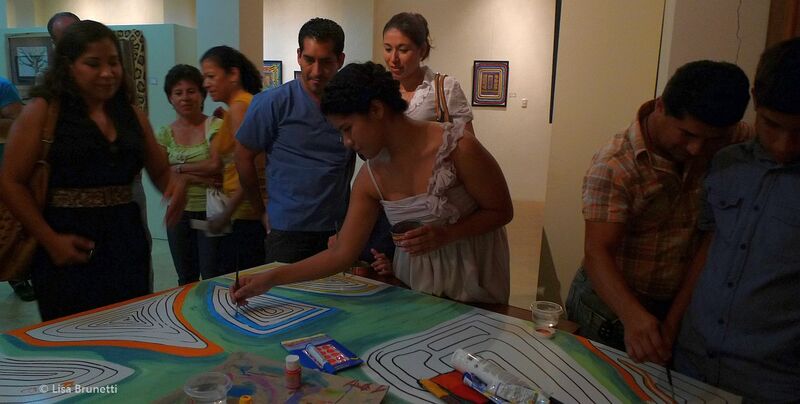 It was a really good idea going to your riverhouse to meet the sunset, and then it was a big surprise to find Natalia and Nicolas with brushes in their hands, painting side to side with you! They really loved the “casa loca”, and there wasn’t a problem changing another beach day for another day of art with Lisa. Now we have an amazing masterpiece, and incredible memories on your company. Thank you for being and exceptional Jama tour guide! You have such an inspirational place to live in Lisa. I love how the children have joined in with the creating process. That view out of the window is so relaxing. Does that river ever flood? What a delightful home you have and how much fun your guests must have helping you make it an even more bright and happy place! This is/you are amazing in so many ways, but most of all for the warmth, inspiration, and generosity of spirit. What a wonderful wall painting. I love the cat in the swing with the fishing pole…what a fun project. 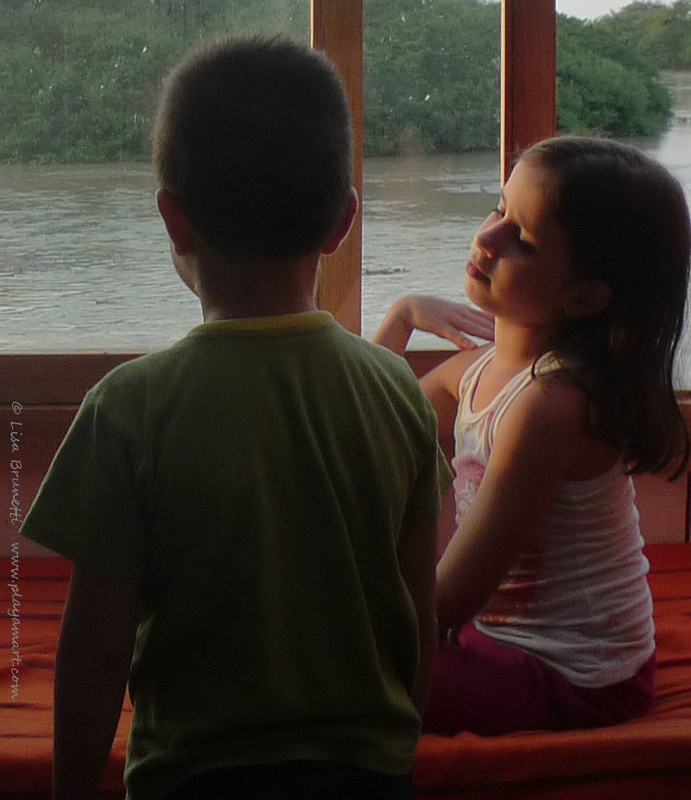 The riverhouse looks like the perfect way for these two beautiful children to showcase their talents. What an exciting project! What joy you share – your characters constantly smile,and even your colours sing! Your commentary bubbles with your enthusiasm. Those youngsters will have enjoyed an unforgettable experience. There is a ‘creative osmosis’ that operates in such a stimulating atmosphere. thank you, louis! yes, ‘creative osmosis’ is a great way to describe what happens with these projects. a friend dropped by tonight and helped with a small section. each person injects more energy and soul into the work! They were able to look AND paint! What a special time for them and you! With that push river view, how do you get anything done? Sweet! thanks, yes, they look and they paint and they give back so much! we are receiving lots of rain, and that river is quite bravo right now. yes, it’s hard to peer outside without stopping and staring as the driftwood and flotsam wash downstream!